I love Gu puds. I buy them at my local Sainsbury’s mostly and it is difficult to not save the glass. I have so many and I use them for my ramekin cookies. Have you tried them? They are AWSOME cookies but we’re here about Gu Zillionaires Puds. These were really not what I was expecting. Those little gold nuggets on the chocolate layer top were pretty. It was such a special treat to see those on the top and so glittering gold. How cute to have (pretend) gold nuggets on the top. The cheesecake is exactly what you’d expect from Gu – light and fluffy while still being deliciously creamy. 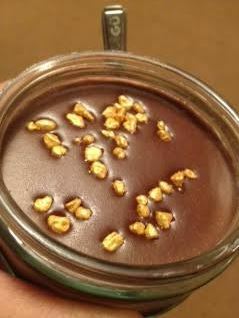 The caramel is delicious on top of a chocolate crumble base. All the flavours work together without being too much of anything at any one time. 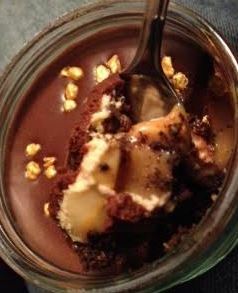 The caramel works with the cheesecake, the chocolate top and the chocolate crumble base. Thankfully the base wasn’t damp for me from the caramel and the cheesecake and chocolate worked perfectly with the caramel and the nuggets. This is so delicious that while I was gifted a box of 2 from the PR I went off and bought another at Sainsbury’s.